The 2017 UEFA Europa League Final will be the final match of the 2016–17 UEFA Europa League, the 46th season of Europe's secondary club football tournament organised by UEFA, and the 8th season since it was renamed from the UEFA Cup to the UEFA Europa League. It will be played at the Friends Arena in Solna, Sweden on 24 May 2017. The winners will earn the right to play against the winners of the 2016–17 UEFA Champions League in the 2017 UEFA Super Cup. They will also qualify to enter at least the play-off round of the 2017–18 UEFA Champions League, and will enter the group stage if the berth reserved for the Champions League title holders is not used. 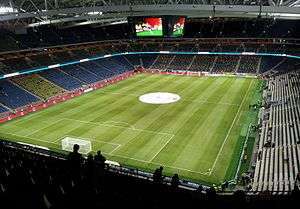 The Friends Arena in Solna will host the final. The Friends Arena was announced as the final venue on 30 June 2015, following the decision of the UEFA Executive Committee meeting in Prague, Czech Republic. The ambassador for the final is former Swedish international player Patrik Andersson, who won the Champions League with Bayern Munich against Valencia in 2001. The "home" team (for administrative purposes) will be determined by an additional draw held after the semi-final draw. 1 2 "Solna to host 2017 UEFA Europa League final". UEFA.com. 30 June 2015. ↑ "Patrik Andersson the face of Stockholm final". UEFA. 23 August 2016. ↑ "Regulations of the UEFA Europa League 2016/17 Season" (PDF). UEFA.com. Union of European Football Associations. Retrieved 26 June 2016.